The PerfectPleat M8 and Dirt Demon Dust Shield have been replaced by the MERV 8 dust reducing pleated filter. More sizes, increased durability and better value! 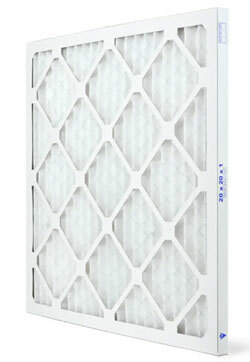 MERV 8 allergen reduction air filter. Superior performance. The MERV 8 dust reducing filter is the workhorse of the pleated panel filter world. They are designed specifically to reduce the number of allergens in your home or office including household dust, pollen, mold spores and microscopic fungi. Heavy duty pleated air filter. It is designed to consistently increase its efficiency throughout the service life of the filter. Premium Grade Residential/Commercial. Available in 1", 2" and 4" depths and custom made sizes. MERV 8. Lasts 90 days.